and animals, and the tallest mountain on the U.S. Atlantic coast." That mountain is named Cadillac, and of course we had to go to its summit. That's how we're wired. This is one of the easiest mountains to summit, however. Anyone in a vehicle can do it by road. If you're more athletic you can ride a bike on the same winding road to the top or hike up one of several trails. The elevation at the top is just 1,550 feet. 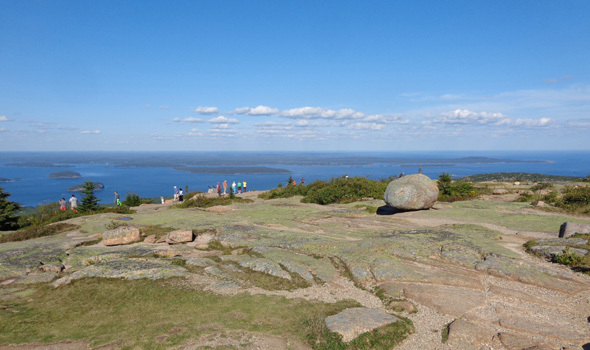 On our first afternoon on Mount Desert Island we drove around the park loop road and to the top of Cadillac Mountain to see the views. Later we learned how popular it is to drive up the mountain to see the sun set. A couple days later we did that and, once again, we were surprised by how many other people were up there. That was the same day I hiked up and back on the southern trail approach to the summit. If we'd been here longer I probably would have hiked up one of the other trails, too. 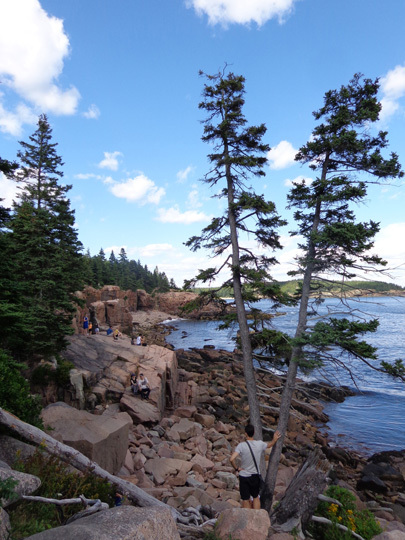 Instead, I hiked twice along the rugged coast so I could see the rocks, trees, and water at closer range. We also cycled all over the island on the dirt carriage roads. I'll have entries about those rides and my coastal and mountain hikes in subsequent entries. 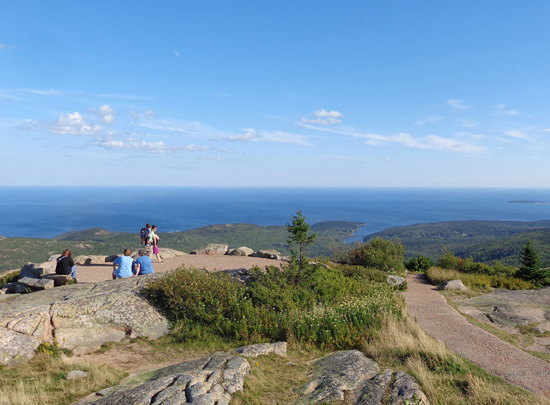 This one features panoramas from Cadillac Mountain the two times we drove up there, as well as other views along the park roads and from overlooks. In other words, you can enjoy all the scenes on this page -- and many more -- from a passenger vehicle with very little walking. 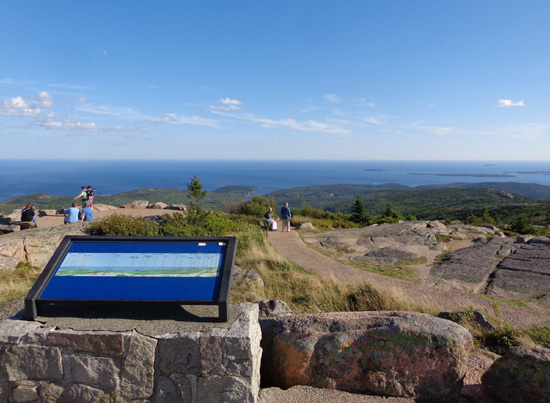 Here's a map of the main part of Acadia NP from the park's website. To view it larger, click on the "View Park Map" link on the homepage. 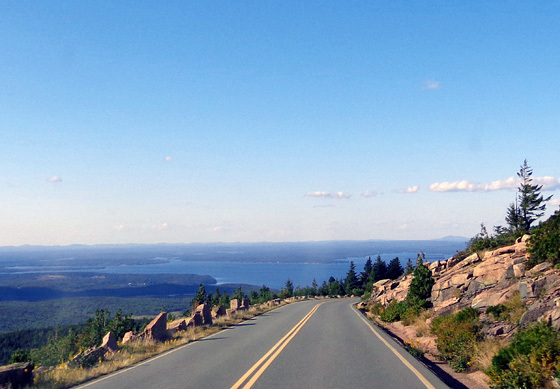 I highlighted the roads we drove in the main area of the park, including the serpentine road up to the summit of Cadillac Mountain. The photos on this page are from that loop and the mountain. 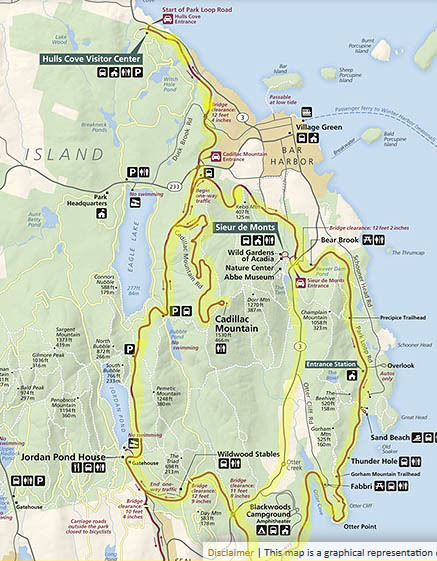 A faster way to reach some parts of the park and the rest of Mount Desert Island is ME 3 inside the eastern part of the loop, also highlighted. 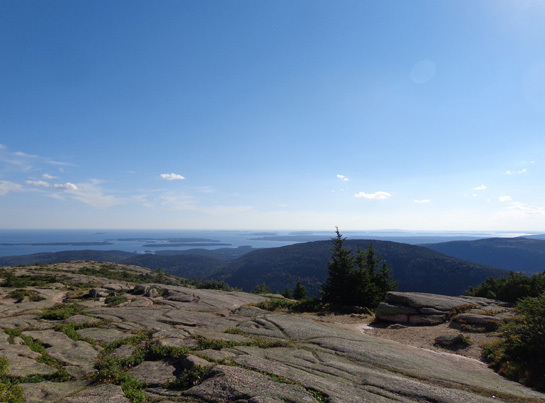 I parked along that road, for example, when I hiked up the south side of Cadillac Mountain. 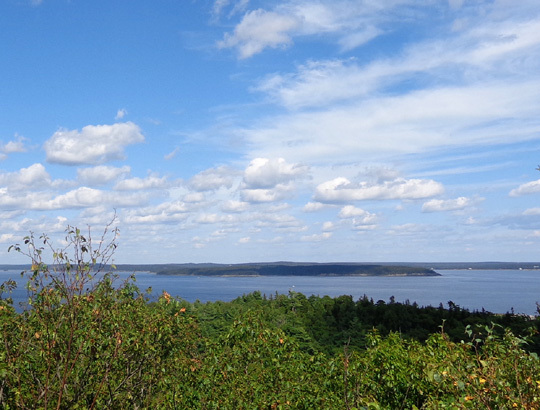 Although you can't see the coast from ME 3 you are closer to Cadillac Mountain on that road. 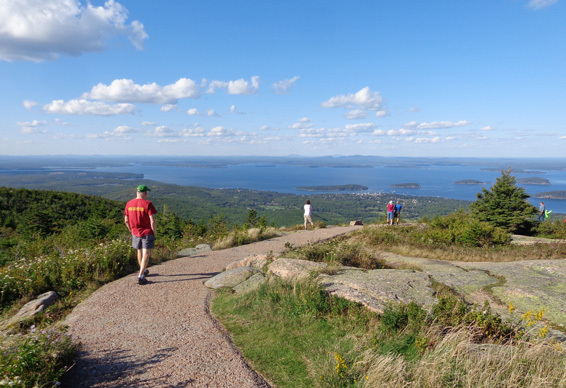 I've just mentioned Cadillac Mountain so far. Note that there are other scenic, but shorter, mountains in the park. You'll see some of them in the photos in this series. 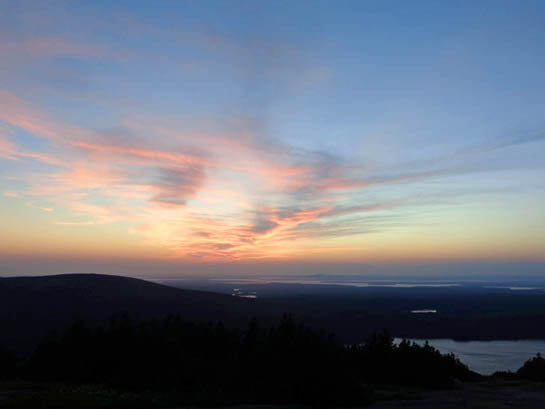 The best place to begin a visit to Acadia National Park is its spacious visitor center located at the north end of the park. 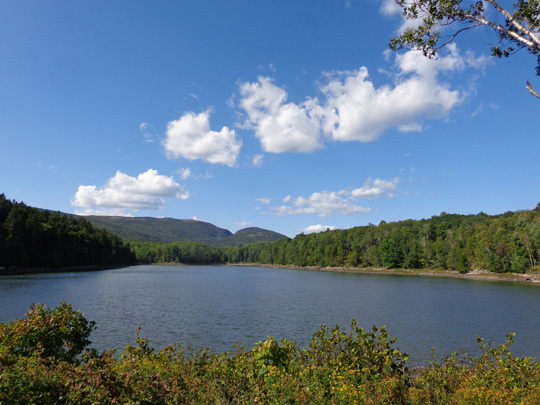 You can gather brochures and maps, look at a large relief map of the park, get information about the carriage and hiking trails, learn about the local history, culture, flora, and fauna, and figure out how you want to spend however much time you have in the area. Path and steps to visitor center are behind the roofed kiosk in the background. 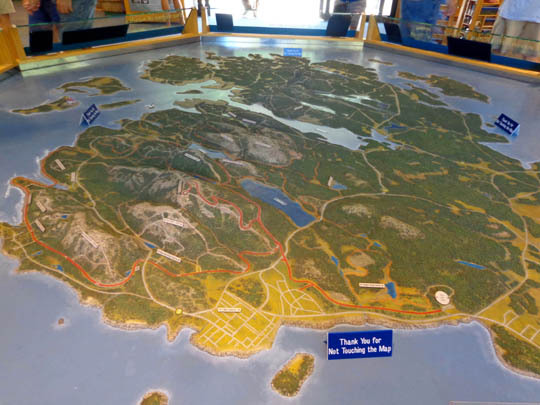 Large relief map of Mount Desert Island; the park covers most of the island. 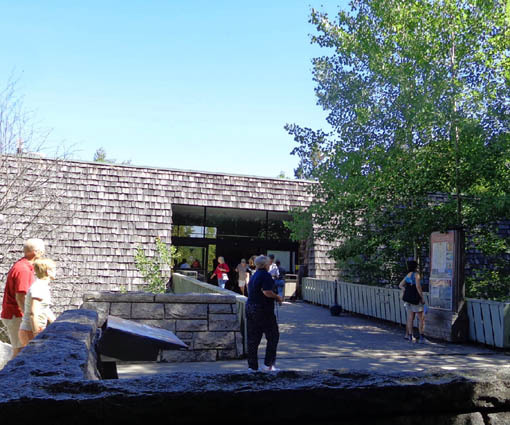 The main parking area is located well below the visitor center; a paved path with steps leads to the entrance. If you're unable to negotiate steps you can drive up the hill to another entrance for handicapped visitors. 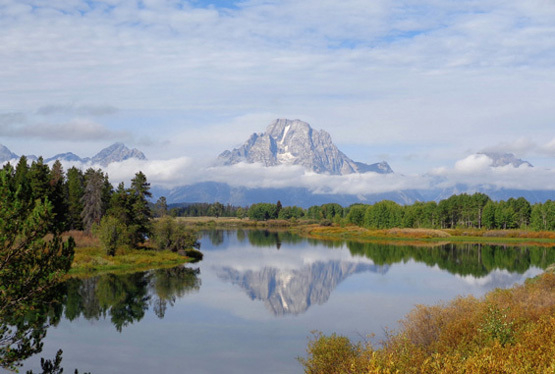 One reason to get a park map before embarking on any road trips, cycling tours, or trail hikes is to determine where the park road is one-way. Most of the eastern and southern side of the park loop is one-way CCW. 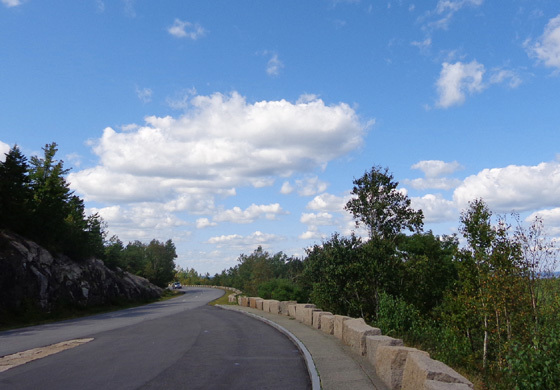 The western side of the loop and Cadillac Mountain Road are two-way. I'll show more coastal views in the next section. 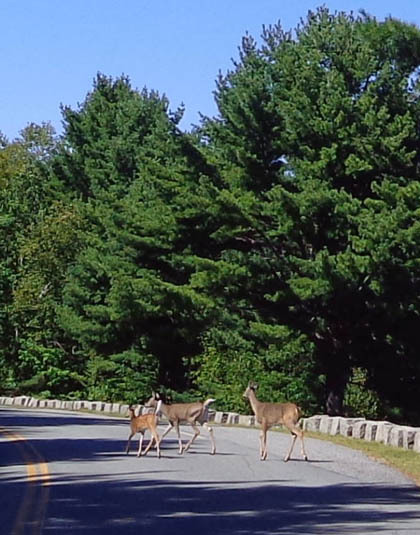 The best advice I can give you re: driving the park loop road is to drive slowly so you can see more (and avoid hitting cyclists, or wildlife like the deer in the middle of the road, below) and get there very early if you want to enjoy super-popular venues like Sand Beach and Thunder Hole. 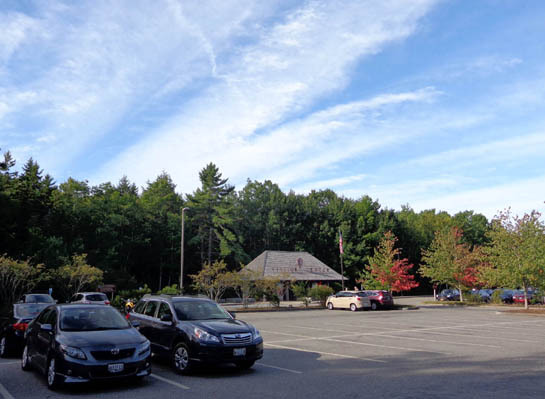 Parking lots and overlooks in popular areas along the loop fill up quickly. When we did our first loop drive the day we arrived on the island we couldn't believe how many people were out there on a weekday afternoon. 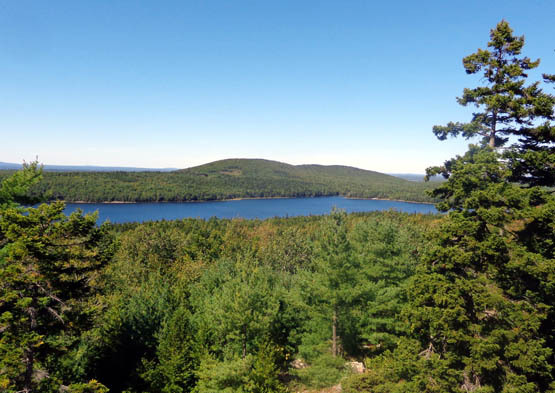 That day we were unable to park in some places where we were hunting for trailheads, like the Jordan Pond House area, and in a few other locations such as Sand Beach where I wanted to take photos. 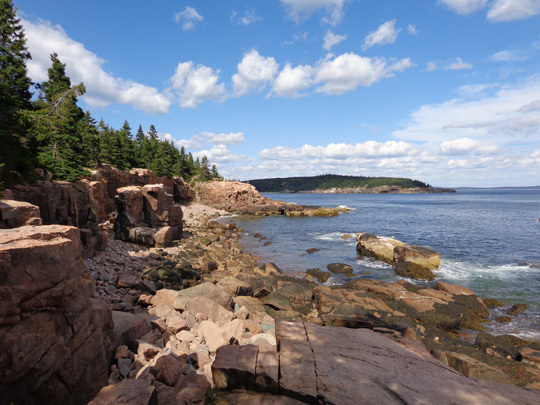 We did, however, score a parking spot fairly close to Thunder Hole and had a short walk there to see some of the beautiful coastline in that area. 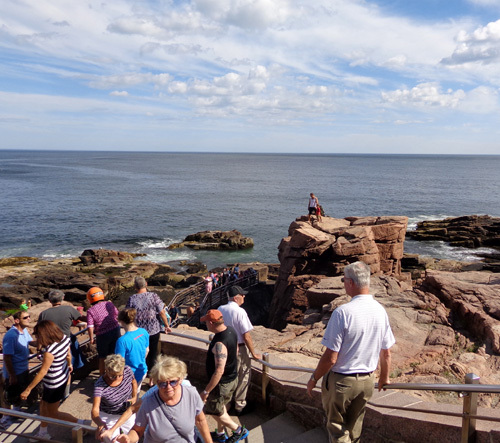 We enjoyed the rocky cliff views from the loop road but it's even better to get out of your vehicle and walk down to the rocks where you can see more and be able to take better pictures. 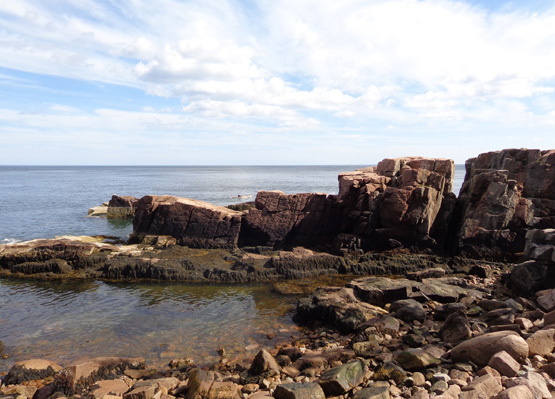 The granite along the Maine coastline is pretty resistant to the relentless onslaught of the Atlantic waves but large blocks of rock sometimes break loose to create rectangular chasms. 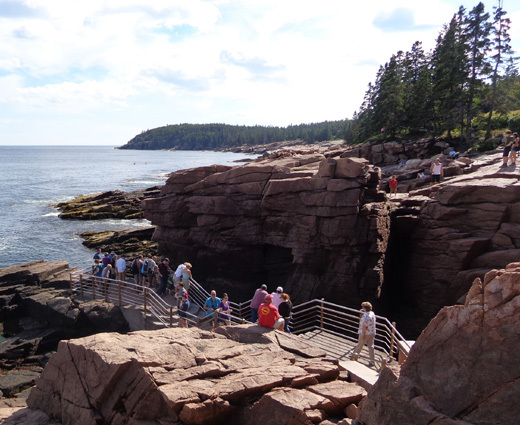 Thunder Hole is a large, partly submerged crevice with vertical granite walls, one of many chasms along this shore. 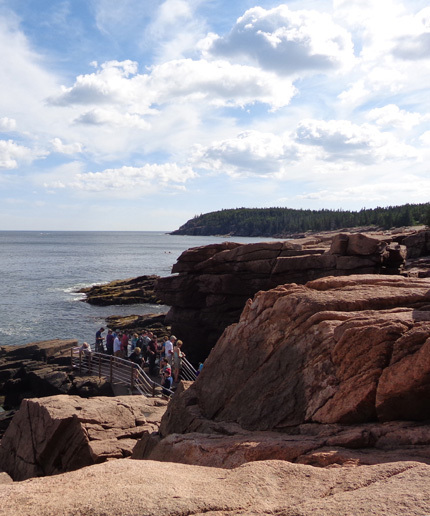 When waves roll into Thunder Hole, especially when the tide is rising, air in the hole is compressed and sometimes makes a sound like thunder. You have to be there at the right time to feel and hear the thunder sound, though. All I heard the two times I stood above the hole was sloshing and gurgling but I was mostly interested in the views anyway. In another entry I'll show more photos from this area from a hike I did several days later -- early in the morning before it got crowded. 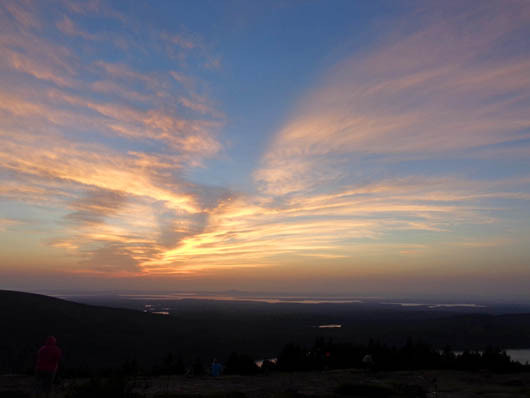 The winding road to the top of Cadillac Mountain affords great views to the west and south to Ethan Pond, Eagle Lake, and the surrounding mountains that were rounded and polished by glaciers many thousands of years ago. 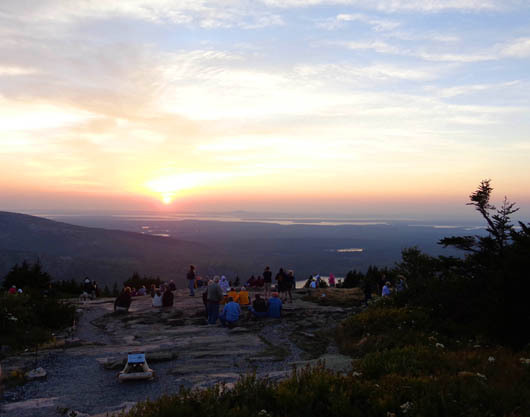 Cadillac Mountain Road is wide enough, and the parking area on the summit large enough, to accommodate RVs of any size. Tour buses go up there, too. The grade isn't steep. 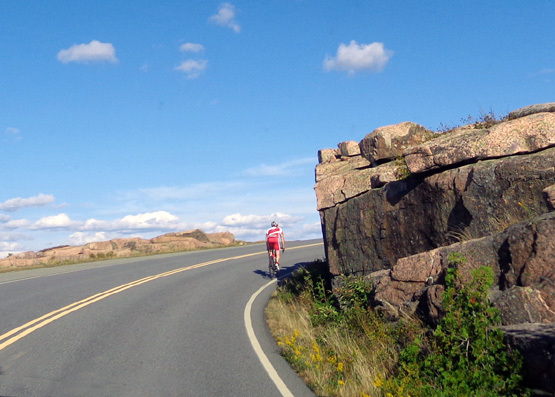 Cyclist riding up Cadillac Mtn. Rd. 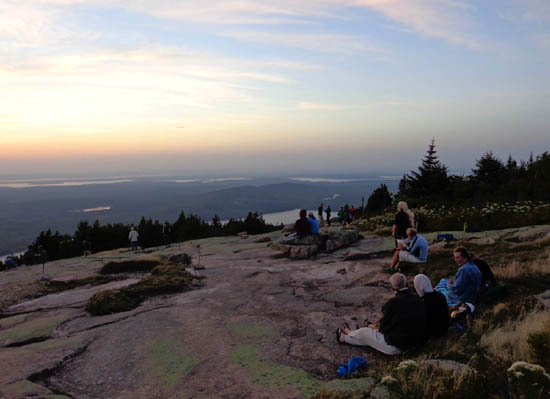 The panoramic views from the summit are even better. Paved paths with interpretive signs allow visitors to see water, coves, islands, and mountains in every direction -- as far away as Mt. Katahdin in northern Maine. It's also easy to walk on the smooth granite bedrock. This interpretive panel identifies the highest mountains in the distance. View south to Otter Cove; I showed a roadside photo of the cove above. 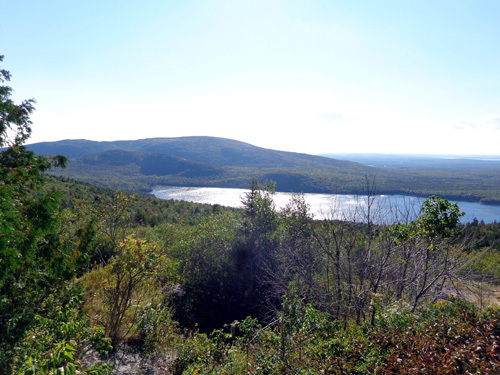 That first afternoon we walked all over the summit to get a 360-degree perspective of the park and surrounding terrain. I spent even more time up there on my hike to the summit two days later. 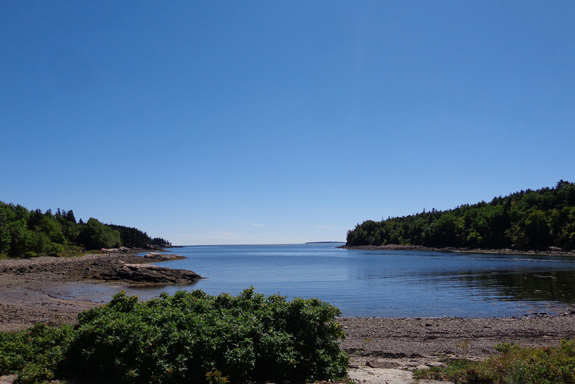 I mentioned in the last entry that you can walk to Bar Island from Bar Harbor on a wide sandbar when the tide is out. 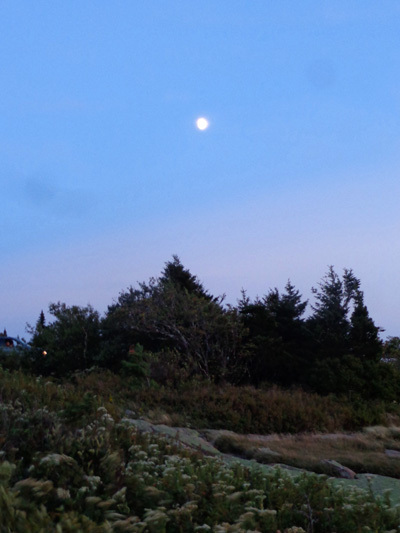 We did that after seeing the island look like a real island from this vantage point on Cadillac Mountain. 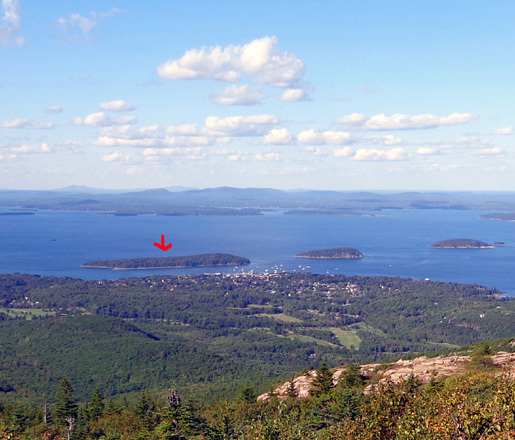 I marked Bar Island with a red arrow. Somewhere in the back ground of that photo is Mt. 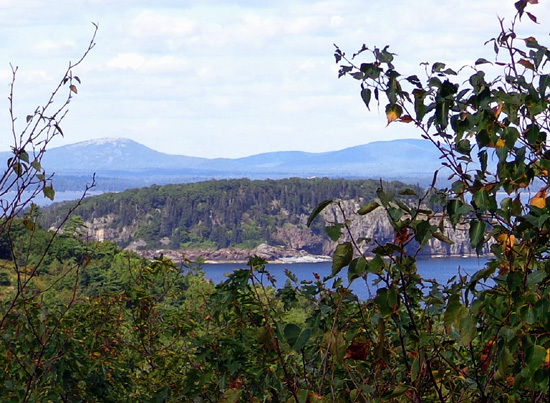 Katahdin, which has special relevance to us. It's where we finished our Appalachian Trail Adventure Run-Hike nine years ago. 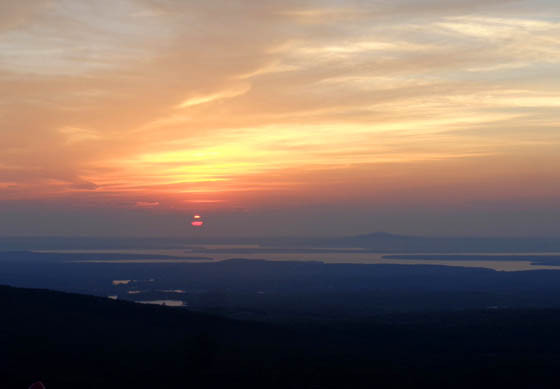 The day I hiked to the summit of Cadillac we both drove back after an early supper to watch the sun set from a high overlook on the western side of the mountain. Jim and the dogs were able to see the sunset from the truck, where it was warm and comfy. 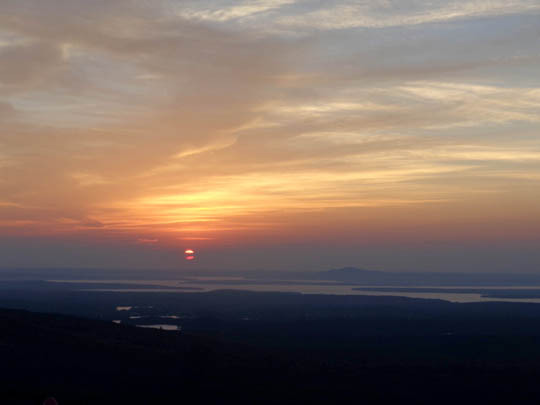 In order to take pictures I walked a little way down the rocky slope where most other observers were watching the sun as it sank lower and lower over the lakes in the valley below. It was chilly and very windy so I stood in an area that was more sheltered by trees. That was interesting but we decided the sunsets were just as nice at Hadley Point, a quarter mile from our campground. Hardly anyone else goes there and the colors are very pretty reflected in the water. 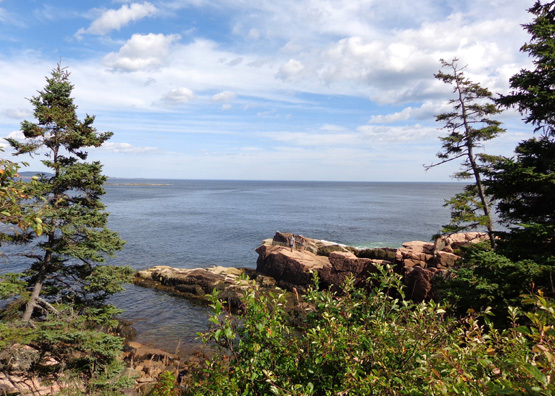 Acadia National Park is gorgeous and we have thoroughly enjoyed our week here. 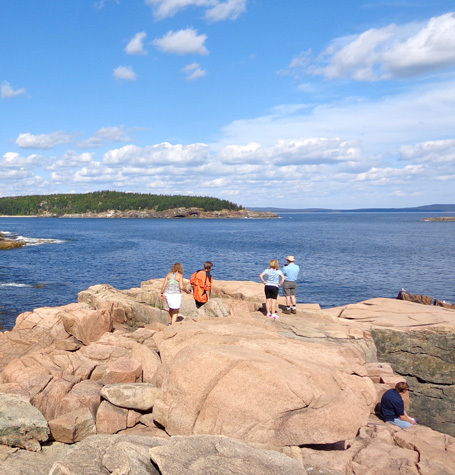 If you haven't been to Acadia, go, even if you have just a day or two to spend in the area. This was Jim's first time visiting the park. It may as well have been mine, too, because the first time I was there was right after the Boston Marathon in April, 1986. It was so foggy my ex and I couldn't even see Cadillac Mountain! This time Jim and I had near-perfect weather for a week and we were able to spend every day outside, enjoying it. I hope we'll be able to return again in a few years.